Makelar Tjerita: Douwes Dekker was lived for a hundred year's? Douwes Dekker was lived for a hundred year's? Well, as we know on this month, at 10th of November, all of Indonesian citizen celebrate’s the National Patriotic Day, to memorize the heroic action of “Arek- arek Suroboyo” ( Surabaya people) who struggle against Allied force who helped the Dutch troops who want’s back to colonize Indonesia. As I know from my history book, at least a thousand of Arek-arek Suroboyo was killed. Still discussing about a patriot, a week ago when I studied history in my class, I get confussed with the content. Why, because when I read about the rise of nation chapter, I found that a national heroes figure’s Douwes Dekker was live for 110 year’s! Wow…amazing wasn’t it? But my logic tell’s different, couldn’t Douwes Dekker live for 110 year’s? Or there’s a same figure which named Douwes Dekker? Let’s figure out! The investigation begin’s from my another historical book which avaible in my house. I got nothing from there, then Bingo…. !When I searched it on the Indonesian Encyclopedia book, I’ve found it. Apparantelly, the Douwes Dekker who composed the Max Havelaar book with Douwes Dekker who established Indische Partij on 1917. The full name of the Douwes Dekker which composed Max Havelaar is Eduard Douwes Dekker. 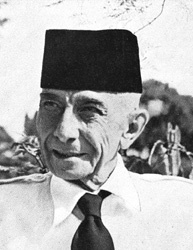 But, the another one is Ernest Francois Douwes Dekker, later we known him as Dr.Setiabudi. Between them there’s still any blood relationship. The Eduard Douwes Dekker or Multatuli (latin: I’ve so much suffer’s) during his life is a resident on Kedu Residency, and officed on Purworejo since 1848. Then he moved to Manado on 1856, and the last, he moved to Lebak, Banten. Over there he saw an unfairness policy from the Dutch government to the native villager, especially on it’s forced labor policy. It makes him to decided for retired from the government field, and go back to his homeland, Dutch. 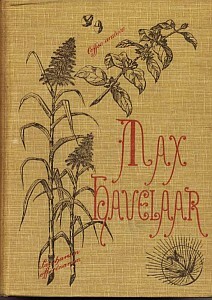 Then, he wrote Max Havelaar which tell’s about the Indonesian people who sufferer’s for colonization. Later, it makes the liberal side on Dutch parlementary proposed the etic politic to Indonesian people which concern on 3 important field, Education, Irrigation and Imigration. Then the others "Douwes Dekker" was, Ernest Francois Douwes Dekker or Dr. Setiabudi who was born on Pasuruan, at October 8th 1879. He's belongs to great grand son of Multatuli. He've become a soldier on British-Boer War on South Africe. As Dutch was lose from the war, Douwes Dekker become a prison-at-war, and shipped to Ceylon (Sri Lanka). Back to Indonesia and become a reporter. He wrote a lot of article’s about Indonesia independency. It make’s the Dutch government dislike to him. Later on 191, together with Dr.Cipto and Suwardi Suryaningrat, established the Indische Partij, the first political pary in Indonesia. The Dutch government infuriated, then sent them three to the prison. But later, Douwes Dekker sent to Suriname to prevented his political activity. After Indonesia gained their independency, Douwes Dekker back to Indonesia and changed his name become Dr.Setiabudi. He also actived on Indonesian political role as the National Ministry of Indonesia on 1947. 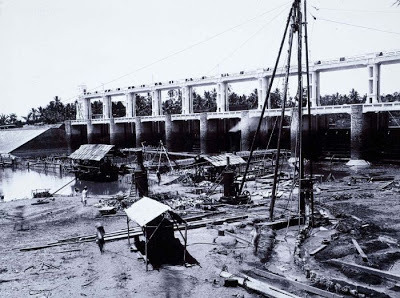 The construction of Dam in Ciujung river, near Pamarajan, West Java. politic together with the immproving immigration and education sector.